A minty to apple green shade of chalcedony that gets its color from traces of nickel. 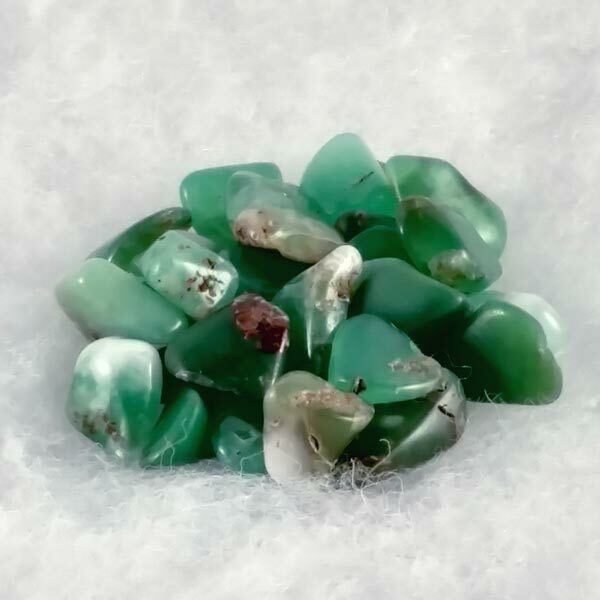 These Chrysoprase tumbled healing gemstones are 3/8 to 1/2 inch in size. Chrysoprase bestows trust and a feeling of security and aids us in becoming independent of others. Soothes heartache and loneliness, fosters emotional balance, resolves conflicts, provides inner peace and strength. Provides courage in facing real emotions. Opens and heals old traumas and grief. Creates a trust in the Goddess, facilitates learning to flow with life, change, and reduces fear. 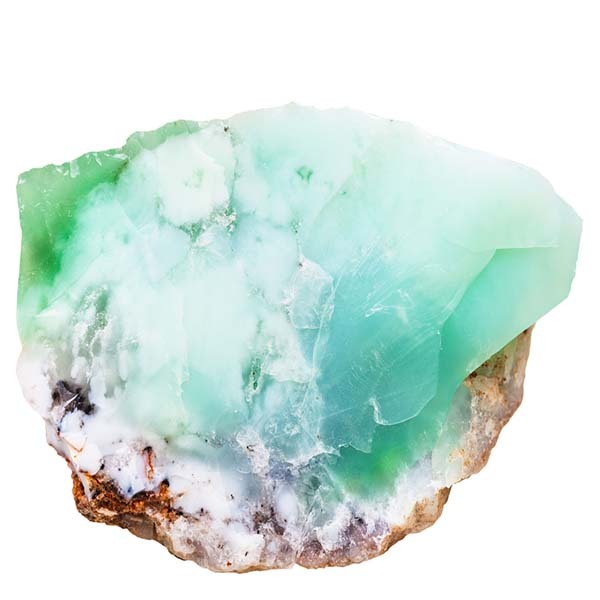 Chrysoprase has a Trigonal crystal system and is in the mineral class of oxide, the quartz group. A form of Chalcedony, its apple green coloring is obtained from traces of nickle. The nickle is dissolved from the surrounding rock by silicic acid and will only provide the color as long as there is water present in the crystal lattice. During its intermediate stage of formation, Prase Opal is created which appears to look almost identical to Chrysoprase. As water is lost, the transformation to Chrysoprase occurs, and as it dries even more it loses its bright green color and slowly pales. You could duplicate the earth's natural processes by placing an Opal on a bed of salt which would remove the water from the crystal lattice, although I definitely could not recommend that for the Opal. This is one of the reasons I never use salt to clear or cleanse any of my gems and use my herbal mix instead. Chrysoprase can be worn as a pendant or used as a hand comforter for long periods of time. Chrysoprase encourages a calm and contemplative view of life and is especially suited to gentle people who have shades of pale blue in their aura. Chrysoprase bestows trust and a feeling of security. It will aid in becoming independent of others and to be content with ourselves. While it physically detoxifies, it also relieves us of oppressive images or can help to deal with them. It will aid in putting an end to recurring nightmares, especially in children who may wake crying at night and not recognize their surroundings. Chrysoprase helps us to recognize egotistical motives in ourselves by encouraging an examination of whether our real actions are in or out of harmony with our own inner ideals. It aids in avoiding compulsive behavior and thought patterns, and in cases of negative attitudes, draws our attention to positive events. Chrysoprase stimulates detoxification and elimination. Even heavy metals and other substances that are difficult to dissolve can be eliminated from the body by using this stone. Additionally, it strongly stimulates the liver's functions to eliminate toxins that have come from taking strong medicines, helps skin diseases and can stimulate fertility in women (especially if infections have led to infertility). Chrysoprase has a special affinity with Libra. Its Energy is Receptive, its Planet is Venus, and its Element is Earth. It has been written that Chrysoprase was once used by thieves sentenced to be hanged or beheaded. A piece would be placed in the mouth and they would escape execution. Although I am not sure how this fortunate result was obtained, it seems likely that it was believed to have carried the same qualities of Opal, long praised for its ability to make one invisible. Considered a lucky stone, it is worn for eloquence, success in new undertakings and to attract friends. In the 13th century, it was engraved with an image of a bull and worn as an amulet for protection, and it is still used today as a shield against negativity. To attract money, carry a piece with you at all times.